Every October, I look forward to the Halloween picture book display at my local bookstore, hoping to find something new to tickle my imagination. This year did not disappoint. This year I discovered Ginny Goblin. 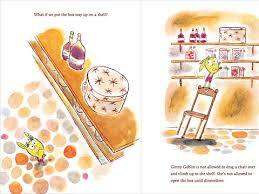 Ginny is the star of Ginny Goblin is Not Allowed to Open This Box, a delightful tale of a curious goblin and a box that is forbidden until dinner time. Ginny is not allowed to open the box. She is not allowed to climb on a chair to reach the high shelf to open the box; no, she definitely is not. But that is just the beginning. Ginny is absolutely not supposed to put on a ninja suit and use a rope and a grappling hook to get the box. Ginny is not allowed to storm the box-containing castle with a catapult. Or goats. She’s definitely not allowed to recruit goats to help her. Ginny’s imagination has no bounds, and she can lead your students to follow suit. 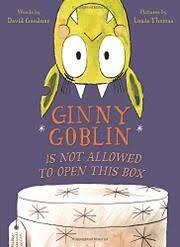 Ginny Goblin is Not Allowed to Open This Box can be used to teach about prediction, or about curiosity, but my favorite option is to have young students imagine new pages describing all the many things Ginny is not allowed to do. I suspect some of your imaginative students will identify with Ginny, in both her proposed adventures and her efforts at self-control. In that regard, she is a fine example, in October, or any other month.